Heat oven to 375°F. Spray 10 regular-size muffin cups with CRISCO® Original No-Stick Cooking Spray. In 8-inch skillet, cook bacon until crisp. Drain on paper towels. Crumble bacon; set aside. Meanwhile, in small bowl, beat cream cheese until smooth. Gradually add milk and eggs, beating at low speed until smooth. Stir in Swiss cheese and onions. Set aside. Separate dough into 10 biscuits. Press or roll each to form 5-inch round. Place 1 biscuit round in each muffin cup; firmly press in bottom and up sides, forming 1/4-inch rim. 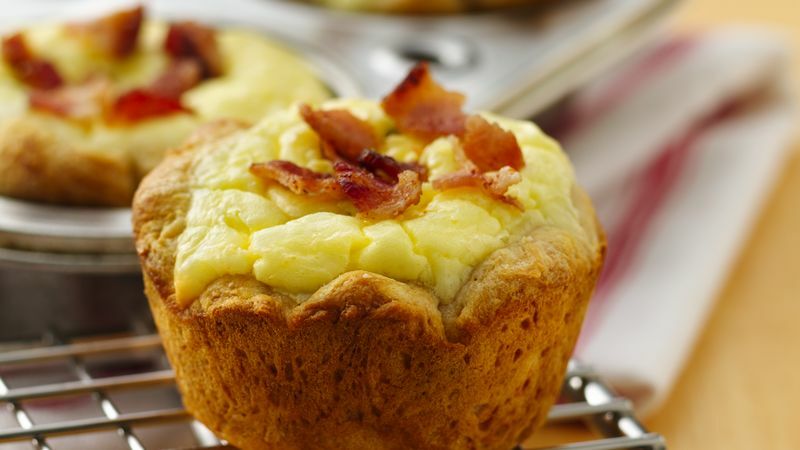 Place half of bacon in bottom of dough-lined muffin cups. Spoon cheese mixture evenly into cups. Bake 21 to 26 minutes or until filling is set and edges of biscuit cups are golden brown. Sprinkle each with remaining bacon; lightly press into filling. Remove biscuit cups from pan.